5) Ed Lu’s description (edited) of the B612 Sentinel mission, taken from his prepared remarks at the March 20 planetary defense hearing of the U.S. Senate: [http://spaceref.com/news/viewsr.html?pid=43620]. The first task we must undertake if we hope to protect ourselves from asteroid impacts is to conduct an astronomical survey of asteroids whose orbits approach Earth. The B612 Foundation therefore decided to build, launch and operate a solar orbiting infrared space telescope called Sentinel to find and track asteroids which could impact Earth. Sentinel will be launched in July 2018, and during the first 6.5 years of operation will discover and track the orbits of over 90 percent of the population of Near Earth Objects (NEOs) larger than 140 meters, and the majority of those bigger than the asteroid that struck Tunguska (~40 meters). Sentinel will discover 100 times more asteroids than have been found by all other telescopes combined. The Sentinel mission is designed to give humanity sufficient warning time to be able to prevent threatening asteroid impacts… The B612 Foundation expects to raise about $450M over the next 12 years to fund all aspects of this mission including development, integration and test, launch, operations, and program expenses…. One of the advantages B612 Foundation has as a private organization is that it is not bound by federal procurement regulations. This allows B612 to make decisions and move quickly without the cumbersome regulations designed to prevent favoritism in federal contracts, but which can add great overhead and slow decisions in cases where there is a clear best approach and contractor…. BATC [the prime contractor] has carefully explored the implementation of the Sentinel mission and has identified high-heritage existing hardware system implementations (The Kepler and Spitzer spacecraft) that enable BATC to quantify the risk of manufacture and operation of Sentinel. Thus, we have been able to choose BATC as our contractor, and to make rapid progress towards a commercial contracting approach. B612 Foundation and NASA have signed a Space Act Agreement in which NASA will provide use of the Deep Space Network (DSN) for telemetry and tracking, as well as allowing NASA personnel to participate on the independent technical advisory team known as the Sentinel Special Review Team. NASA and the scientific community benefit because B612 will make the data available to the community through the standard process for reporting NEO observations. The Sentinel mission places an infrared imaging telescope in a Venus-like orbit to identify and catalog NEOs over a 6.5-year mission life. The “Venus-like” orbit at ~0.7 AU provides up to a 200 degree, anti-sun viewing field that the observatory methodically scans to detect the infrared light coming from any moving object in the field. By making observations from ~0.7 AU, Sentinel views a much larger portion of the sky relevant to finding NEOs than can be seen from the Earth, either from ground-based or space-based observatories. A space-based survey is also not compromised by the atmosphere, or by the presence of the moon, or by the requirement to look for NEOs low in the sky during twilight. Locating Sentinel in space near 0.7 AU from the Sun has the additional benefit of being interior to most NEOs, thereby observing them when they are closest to the Sun and at their brightest. This, or a similar orbit, is essential for detecting those long-synodic-period (low relative velocity with respect to Earth) NEOs that are the most dangerous and valuable to future exploration missions. Sentinel will be launched from Earth on a Falcon 9 rocket. The cruise to the final heliocentric orbit at ~0.7AU uses a Venus gravity assist to minimize fuel requirements… Flight data from the DSN is first processed at a ground station at the Laboratory for Atmospheric and Space Physics at the University of Colorado… The telescope is cooled to 45K by a combination of radiative and active cooling. The instrument’s HgCdTe focal plane is actively cooled to 40K. The detection band from 5 to 10.4 microns is optimized for detecting T=250K objects, a characteristic temperature for NEOs near 1AU. The telescope is mounted on a Kepler-derived spacecraft, and reuses Kepler’s avionics and structure. To detect a NEO, we require two pairs of observations of the anti-Sun hemisphere in 24 days. The images are taken in correlated pairs that reveal the motion of any NEO in the 1-hour span between images. All the data for each pair of images is first stored, and then later compared on-board, and NEOs are detected by their motion during the one hour interval between the two images. 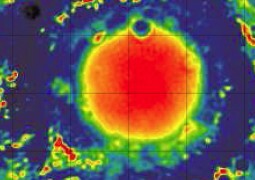 We greatly reduce the amount of telemetry data by retaining only those portions of the imaged field that contain pixels determined by the dedicated on-board computer. At the ground station, the observations are converted into detection-fragments called “tracklets.” Tracklets are then sent to the IAU Minor Planet Center (MPC) in Cambridge, Massachusetts. The MPC maintains the world’s NEO database, and will convert tracklets into orbits. These MPC orbits then go to the Near-Earth Object Program Office at JPL which refines the initial MPC orbits, calculates the likelihoods of any impacts and globally distributes its findings. In 6.5 years of operation, Sentinel will detect and track the great majority (>90%) of all NEOs larger than 140m. In addition, Sentinel will detect and track 50% of all NEOs greater than 50m. Summary: Sentinel is important on a number of levels. First, the B612 Foundation is pioneering a new model for carrying out large space missions in which Sentinel is philanthropically financed and privately managed, but with a crucial government partnership. Second, the primary goal of the mission is not scientific. While it is true that Sentinel will be a groundbreaking new astronomical instrument, the primary requirement for the mission stems from a planetary defense (i.e. public safety) goal. Once Sentinel is in operation, it will generate a flood of new NEO discoveries, far in excess of all other observatories combined. After 6.5 years of operation it will discover and track approximately 1,000,000 NEOs, as compared to the currently known total of about 10 thousand. Not only will this catalog provide a list of potential targets for robotic and human exploration, but should any of these NEOs be on a collision course this information can allow us to successfully mount a deflection campaign and prevent a catastrophe. Our future may depend on it. The new GRAIL insights about Orientale suggest that other ringed basins, invisible in images, could be discovered by their gravity signature.